I really enjoyed the teacher and the class setting. I am very happy. Thank you for everything, Carol. I would highly recommend this course and school to anyone with an interest in this field. Its a great group of students. 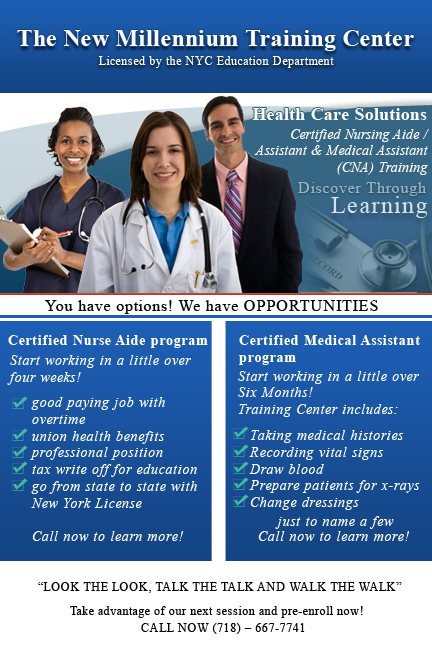 Nurse Marie is a wonderful instructor. 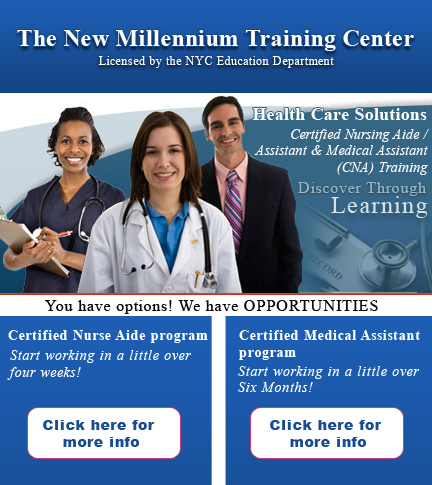 The New Millennium Training Center is the best, they have a wonderful instructor which is the best. I am happy with the training provided and will definitely recommend students to this school. Kelly is a wonderful teacher, very knowledgeable in what she does and makes learning fun and easy to comprehend. Kelly is an amazing teacher and shows each and every student that they have what it takes to be a competent, professional MA. Kelly is an excellent instructor. I couldn't ask for a better learning experience. You are doing a wonderful job!! Keep it up. I enjoyed and found the class very interesting. The instructor (Marie) is a wonderful teacher. Thank you for everything. I finally have a certification license that I can take with me anywhere I go and get a position in a professional setting. 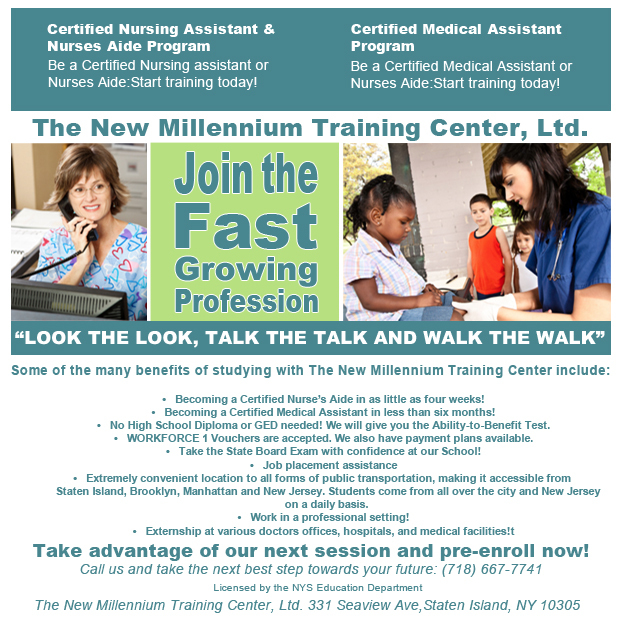 I think that The New Millennium Training Center is the finest healthcare training school in Staten Island. 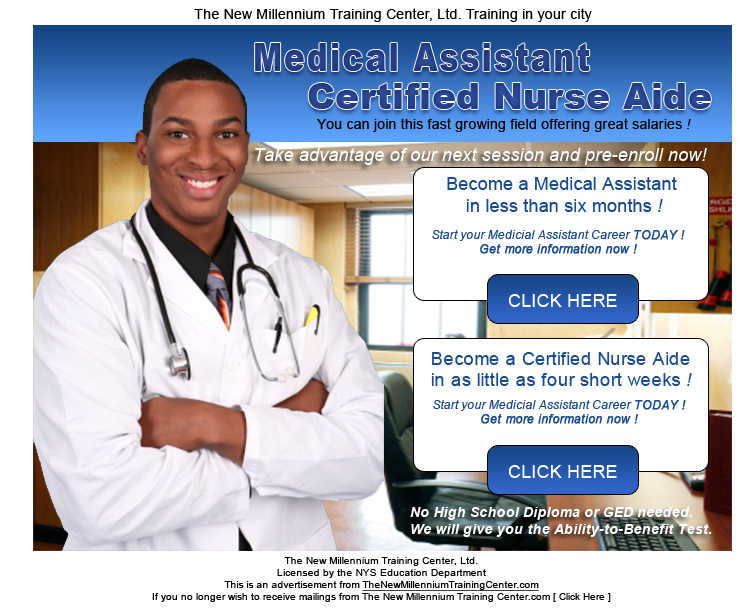 They care and help you every step of the way towards success. Thank You. The teacher was the best, I was really ready for my final test.